Although a substantial French Protestant community existed in London from the sixteenth century, the suppression of Protestantism in France in the 1680s led to a mass migration of predominantly Calvinist refugees, many of whom settled in London. Divided between Spitalfields in the east and Soho in the west, the French Protestant community was one of the largest and most distinctive communities in the capital throughout the eighteenth century. The fortunes of this community waxed and waned with those of the silk industry and went into sharp decline in the early nineteenth century. From the end of the eighteenth century a new émigré French community emerged in parallel, more fully centred on Soho and Fitzrovia. These new émigré responded to the rhythm of European politics rather than to the click clack of the weaver’s shuttle. Following the dragonnades, forced conversions to Catholicism which began in 1681, and the Revocation of the Edict of Nantes in 1685 which outlawed the practice of Protestantism in France, hundreds of thousands of men and women were forced to flee to the Netherlands and America, and as far afield as the Cape of Good Hope. Between 50,000 and 80,000 of these committed Calvinists settled in England, with perhaps half this number eventually finding a home in the Greater London area. Because emigration was illegal under French law, many came with few resources, buoyed up only by strongly felt religious conviction. At the same time many of the refugees possessed skilled trades associated with weaving, clockmaking and financial services. There was also a large number of intellectuals. On arrival in London, French refugees found two already well-established French churches. The first was in Threadneedle Street in the City, where a strict and continental Calvinist form of worship was practiced, and the other at the Savoy, in the West End, where an Anglican form of worship was followed. These two churches became the focus for the growing number of refugees, and the centres of two largely coherent communities. These two early churches were then followed by others. By 1700 there were nine French churches in the East End (all of which practiced a Calvinist form of worship), and twelve in the West End (six of which celebrated Anglican communion, and six a Calvinist liturgy). The traditional and virulent anti-Catholicism of Londoners, in combination with propaganda depicting the atrocities committed against Protestants in France, ensured that the refugees had a surprisingly warm welcome. Despite threatened riots against French weavers in the East End in 1675, 1681 and 1683, and vocal opposition to the creation of a new French church at St Martin Ongars, there appears to have been little physical violence directed against the French refugees. More positively, particularly after the Glorious Revolution in 1688 and the accession of William and Mary, Huguenots received a remarkable level of charitable support. At the end of the seventeenth century, for example, some £64,713 was raised by royal brief for their relief, while William and Mary donated £39,000 to help Huguenot resettlement between 1689 and 1693 alone. At the same time, the concentration of French speaking immigrants in well defined communities ensured the survival of a distinctive culture and identity for several generations. Both their language and fashions set the French apart, and there were complaints about their unfamiliar diet. But they acquired a certain respectability. 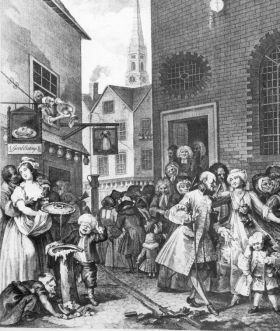 Even in 1738, William Hogarth could contrast the clothing and behaviour of a French Protestant congregation leaving church with the poverty, squalor and sexual immorality of other Londoners. And many prospectiveEnglish gentlemen about to set off on the Grand Tour made an initial visit to the East End to polish their language skills. Textile manufacturing, in particular silk weaving, formed the largest single occupation for the French refugees. This work was concentrated in Spitalfields, and a substantial number of large workshops were established. These employed many hands and made their owners extremely wealthy. 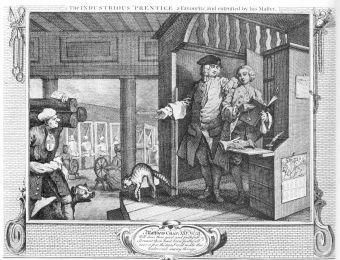 By 1747 Hogarth could knowingly depict his "Industrious Apprentice", Francis Goodchild, entrusted with a large silk-ribbon manufactory in Spitalfields, on his way to becoming Lord Mayor of London. This reflects both the wealth of the silk weaving community and its increasing importance to the broader London economy. The decline of silk weaving in the late eighteenth century, as new Indian and Chinese fabrics became more readily available and as smuggling of continental silk became more commonplace, adversely affected the community around Spitalfields. The "Spitalfields Acts" passed between 1765 and 1801 attempted to regulate wages and working conditions, and to protect the domestic market from overseas competition. Nevertheless, the economic prosperity brought by the trade slowly ebbed away, leading to frequent and violent clashes between masters and journeymen over wage rates and the introduction of new machinery (particularly in 1768-69 and again in a series of violent strikes in 1829). Despite the economic problems of the industry, made worse by trade liberalisation from 1826, a substantial community clung on in the area around Spitalfields and adjoining Bethnal Green. Even in 1850 the industry employed some 30,000 individuals, generally at starvation wages. By the end of the nineteenth century some 60 working looms remained in the garrets of the once elegant eighteenth-century townhouses of Spitalfields. Huguenots also made substantial contributions to other economic sectors, particularly watch making, silver smithing and finance. Most of these activities were concentrated in the community around Soho in the West End. Mirroring the gradual decline of the Huguenot East End was the rise of an ever more cosmopolitan community dominated by French émigrés in Soho and Fitzrovia. 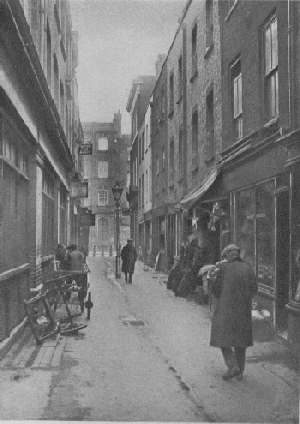 The open spaces of St Anne Soho were originally built into a dense urban environment during the 1670s and 1680s, and from their beginning were peopled by the French. In the mid-eighteenth century William Maitland could claim: "Many parts of this parish so greatly abound with French that it is an easy matter for a stranger to imagine himself in France". As with Spitalfields and Bethnal Green, late seventeenth and early eighteenth-century immigrants to Soho were driven by religious conviction and dominated by Protestant refugees, but following the French Revolution and the Terror, this population in the West End was substantially mixed with French Catholic priests and political refugees of a very different stamp. By 1801 some 5,600 priests and 4,000 lay French Catholics could be counted as British residents, their community centred on Soho to the south, and Fitzrovia just to the north, of Oxford Street. St Anne’s Court Soho, from St John Adcock, Wonderful London (1926/7), vol. I , p.132. During the course of the nineteenth century these districts attracted émigrés from all corners of Europe, with particular concentrations of Germans and Italians in addition to the French. The revolutions of 1830 and 1848, the agitation for Italian unification, the Franco-Prussian war, and the Paris Commune, all created their own mini-waves of refugees, many of whom landed among the multi-lingual back streets of Soho. By the second half of the nineteenth century, Soho and Fitzrovia could justifiably claim to be the geographical centre of radical European politics. Karl Marx (whose first London residence was a hotel in Leicester Square) was only the most successful and noteworthy of the political agitators and thinkers who took up temporary or permanent residence in the district, which also included Guiseppe Mazzini, Louis Blanc, and the anarchist and bomber Martial Bourdin, whose attack on the Greenwich Observatory in 1894 formed the basis of Conrad’s novel The Secret Agent. The trials of many notable anarchists can be found in the Proceedings from 1892 onwards. With its own French language newspaper, La Chronique, inexpensive restaurants where prix fixe meals encouraged democratic debate over the fate of Europe’s nations, theatres and schools, communist soup kitchen, and louche clubs and French bakeries, Soho and Fritzrovia formed a French accented centre to cosmopolitan London. No general act of naturalisation was ever passed in relation to French refugees, and they retained their status as "free denizens", first offered by Charles II, through the first generation. When defendants and prosecutors did not speak English they were normally provided with a translator. A special jury could also be empanelled comprising six foreigners and six native Englishmen. Unlike other migrants, French refugees were not described using a language of race, and were seldom specifically identified in the Proceedings. This lack of specific identification is made more problematic by the tendency until at least the middle of the nineteenth century for all foreigners, of whatever nationality, to be labelled "French". One can locate the trials involving violence between journeymen weavers and their masters by searching by offence. Searching for the offences Breaking the Peace> riot and Damage to Property > all subcategories, in the years 1768-69 will find relevant trials. For political trials involving specific groups, keyword searching using contemporary terms, frequently gains good results. A search on Anarchist, for instance, produces around sixteen trials. A sharp eye for French names, such as Champion, Rondeau or Bourdon, is required in order to identify which of the individuals thrown up through this kind of searching were likely to have been French. Using a wild card strategy is not effective in this instance. Searching on the word interpreter or translator will bring up large numbers of trials involving foreign witnesses and defendants. Carpenter, Kirsty, Refugees of the French Revolution: Émigrés in London, 1789-1802 (Basingstoke, Hants., 1999). Gwynn, Robin, The Huguenots of London (Brighton, 1998). Gwynn, Robin, Huguenot Heritage: The History and Contribution of the Huguenots in Britain (2nd edn, Brighton, 2001). Summers, Judith, Soho: A History of London's Most Colourful Neighbourhood (London, 1989). Vigne, Randolph and Littleton, Charles, eds, From Strangers to Citizens: The Integration of Immigrant Communities in Britain, Ireland and Colonial America, 1550-1750 (Brighton, 2001), part vii.